Humans lack the enzyme necessary to digest cellulose. Hay and grasses are particularly abundant in cellulose, and both are indigestible by humans (although humans can digest starch). Animals such as termites and herbivores such as cows, koalas, and horses all digest cellulose, but even these animals do not themselves have an enzyme that digests this material. Instead, these animals harbor microbes that can digest cellulose. To reduce METHANE EMISSION by improving overall digestion of feed inputs in livestock by using our special herbal mix for large ruminants, (dairy animals) small ruminants, (Goat and sheep) and also in poultry to reduce AMMONIA EMISSION. METHANE EMISSION reduction from livestock not only helps for having better environment, but mainly it helps in saving the energy being un-utilized by the animal thus leading to higher per unit cost of the nutrient formulated in the feed. All varieties are produced with addition of our Herbal Mix. Herbal Mix consists of beneficial microbes and bacteria. The Herbal extracts and the microbial culture developed has several beneficial properties like digesting overall feed & fiber very effectively and result in better yield, quality of milk & then finally the animal health which can be observed in better shining within 30-45 days. All varieties of our cattle feed will perform equal & better than other brands having 1-2 % higher nutrient value. This is because of our “HERBAL MIX” which helps to utilize the nutrients effectively than other brand which leads to better performance at lesser product cost. Herbal mix developed by us improves the rumen microbes (beneficial) and to maintain a healthy gut micro flora. Bad odour in cow dung will be very much reduced and cow dung will be very fine without having much of undigested feed particles. Animal is the lab. It will display all the effects of the feed which has been consumed. This is produced with an aim of developing an alternate feed, since the feed cost is escalating and is no more affordable as the milk price does not see any relative price hike being an essential commodity. To reduce METHANE EMISSION from cattle by improving digestion & absorption of overall feed inputs and to maintain healthy gut microflora. Can be replaced 10-20% of concentrate feed of any variety. This cannot be done with other available bran varieties in the market. It will maintain the same milk yield and quality by reducing the production cost. 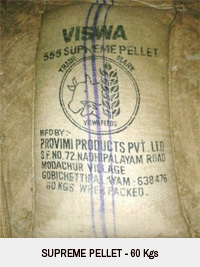 Can be replaced 100% for rice bran and karukkai bran and can observe increase in milk yield and quality thus reducing the cost of production. 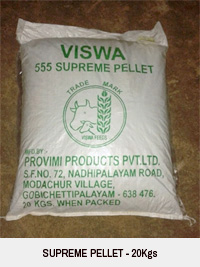 Can be replaced 50% for wheat bran and can observe increase in milk quality thus reducing milk production cost. It reduces dry fodder intake. 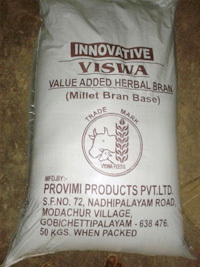 Produced with Minor Millets bran and rice bran, karukkai bran fortified with our Herbal Mix and blended with molasses and etc helps to reduce the milk production cost and to improve quality of milk along with animals overall health. 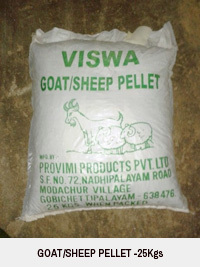 INNOVATIVE goat/sheep feed pellets is produced with the addition of our Herbal Mix that aims to reduce METHANE EMISSION from livestock by improving digestion and absorption of overall feed inputs. Low dosage @ 100 gram and 300 gram for adult sheep and goat respectively at low cost which is produced with highly digestible fiber. Regular feeding to adults will help for its healthy survival even with less grazing. Considerable reduction in mortality of kids happening due to nutritional deficiencies. Considerable increase in adults milk yielding capacity after kidding and will maintain its health during pregnancy & after kidding. Excess milk after feeding to kids can be used by the farmers and the milk is very healthy. Achieving the kids marketable weight at an early age of 5-6 months. Improvement in quality & taste of meat. Also our semi-whole feed (concentrate + fodder) that has higher digestible fiber percentage. It is fed @ 300 grams for both adult goat and sheep, during heavy rains, deep winter and hot summer. It will meet the considerable green fodder need of small ruminants.